The brother of a U.S. Border Patrol agent charged with capital murder in a gruesome beheading that authorities say was a Mexican cartel hit struck a surprise deal Thursday to cooperate with prosecutors in their case against his siblings and other defendants. BROWNSVILLE — The brother of a U.S. Border Patrol agent charged with capital murder in an alleged Mexican drug cartel hit struck a surprise deal Thursday to help prosecutors build their case against his siblings and other defendants. Fernando Luna — older brother of Border Patrol agent Joel Luna — pleaded guilty to possession of a controlled substance, cocaine, before state District Judge Benjamin Euresti. In exchange, prosecutors agreed to drop three far more serious counts against him springing from the murder of Jose Francisco Palacios Paz, whose headless body was found floating off South Padre Island in 2015. Before agreeing to the deal, Fernando Luna had been facing life in prison. He now will get no more than three years and could get a sentence of probation only, largely depending on how prosecutors view his level of cooperation. Speaking in Spanish and using an interpreter, Fernando Luna repeatedly answered “si” as the judge asked him if he understood what he was agreeing to, including a pledge to “debrief truthfully” with state authorities in their prosecution of the remaining four defendants, including the his brother Joel. The offense in question: the brutal murder and decapitation of Palacios, a Honduran immigrant whose body was found at the height of Spring Break last year. Prosecutors said Palacios was murdered because he knew too much about a drug trafficking operation involving the Luna brothers. Fernando Luna and another Luna sibling, Eduardo, were charged with four felony counts, as were two unrelated co-defendants in June of last year. The middle Luna brother, Joel, a decorated Iraq War veteran and Border Patrol agent, was charged in November. Asked if Fernando Luna might soon take the stand and testify against his younger siblings at their trials, Perez said "that could very easily happen." That a law enforcement official sworn to protect the border might have participated in a Gulf Cartel retaliation murder in Texas would represent a disturbing development in the annals of U.S. Border Patrol corruption. While more than 130 officers employed by U.S. Customs and Border Protection have been caught in alleged acts of mission-compromising corruption over the past decade, the Luna case could take it to new level. Joel Luna and the three other defendants have all pleaded not guilty. So had Fernando Luna, until Thursday. 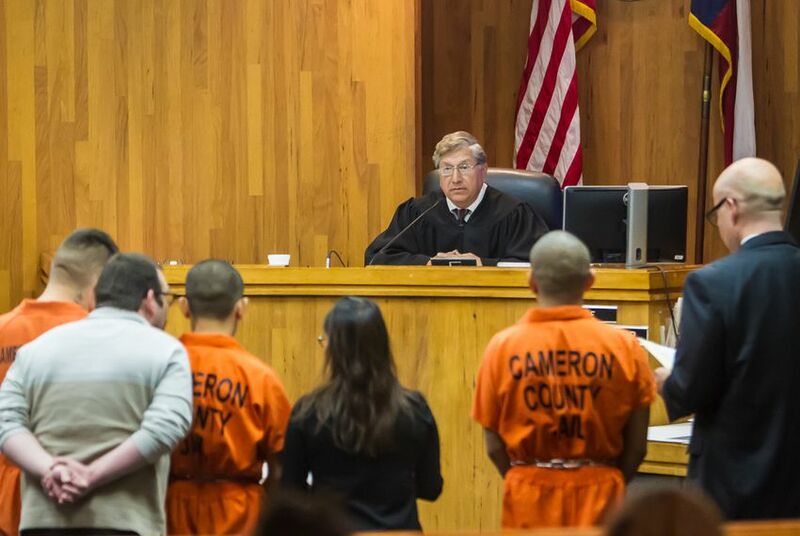 Earlier in the day at the Cameron County Courthouse, Joel Luna's lawyer, Carlos A. Garcia, sought to get his client a separate trial and argued that prosecutors had a thin case against the Border Patrol agent. “By lumping him in together in this birds-of-a-feather manner, we believe that it’s terribly prejudicial to Mr. Luna and respectfully ask the court to” grant a separate trial. Garcia also noted that the state’s own evidence indicates Joel Luna was nowhere near the scene of the March 2015 murder, believed to have occurred at a tire shop in Edinburg. Luna was working at a Border Patrol checkpoint in Hebbronville. But Euresti sided with Cameron County Assistant District Attorney Gus Garza in the state’s move to hold a joint trial. Garza argued that Joel Luna was part of a criminal conspiracy and should be tried with his fellow co-conspirators — including his Mexican-born brothers. After the plea agreement was announced, Garza said it would help prosecutors solve the crime and deliver justice. “I’m just glad that we’re moving forward,” he said. “We want to get to close this matter and find out who else is out there that’s involved." Whether most — or even a significant fraction of — corrupt federal border agents are caught and punished is an open question. Customs and Border Protection boasts of more stringent screening and monitoring of its agents but releases little data to back up its claims.